Choosing the right school for your child is one of the most important decisions you will make. Whitsunday Anglican School shares your aspirations for your child’s education, and we are committed to providing a supportive and dynamic environment, where students flourish and their unique potential is unlocked. For almost 30 years, Whitsunday Anglican School has been helping to prepare young hearts and minds for the challenges of an ever-changing, globalising world. Through innovation and academic rigor, we equip students with the necessary skills to achieve their best. 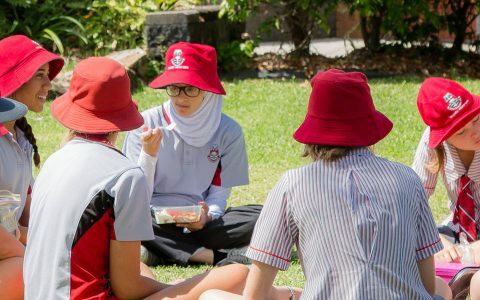 A combination of exceptional pedagogy and a supportive environment sees Whitsunday Anglican School students consistently achieve high academic outcomes. This year Queensland will introduce a new senior assessment and tertiary entrance system. We have begun preparing for the change to the senior schooling system by establishing foundations for the new senior syllabus. We are committed to ensuring our students transition to this system smoothly, and our focus will assist our students in achieving academic success. Whitsunday Anglican School is non-selective. To apply for a position please follow these steps. Find out more information about the School by requesting a Whitsunday Anglican School Prospectus by completing the Online Enquiry Form. If you would like to discuss enrolments with our Registrar, or arrange a private tour of the School, please email registrar@was.qld.edu.au or phone (07) 4969 2000. Complete the Enrolment Application Form – as part of this application process you will need to provide the School with your child’s latest school reports, copy of birth certificate, Visa information (if applicable) and any other documentation (medical or otherwise) that will assist the School in supporting your child’s educational journey with us. A non-refundable fee of $121 will be charged to log an application. Once an Application Form has been submitted you will be invited to attend a confirmation interview with the applicable Head of sub-School. Following this interview, accepted applications will be sent a Letter of Offer and payment of the $615 for day students and $1315 for boarder’s enrolment bond confirms a student’s place at Whitsunday. Please note: Whitsunday Anglican School strives to accommodate entry for each student on an individual basis, and therefore the process of enrolment may vary from what is stated.